Internet Message Access Protocol allows access to email messages on a mail server without the necessity to download the messages in order to peruse a list of them. Selecting a message for closer inspection leads to a copy being downloaded and retained by MailCOPA. However, the original remains on the server until deliberately deleted. Note that because of limitations and requirements of the IMAP protocol many of MailCOPA's advanced features will not be available when using IMAP. Each IMAP server will have it's own inbox and other sub-folder structure. Filtering and folder sharing are not available because IMAP doesn't support these functions. A folder structure can be created for an IMAP server, but note that this is on the SERVER, it does not exist within MailCOPA. If the structure was created by another client, MailCOPA will detect it on the server and show it. 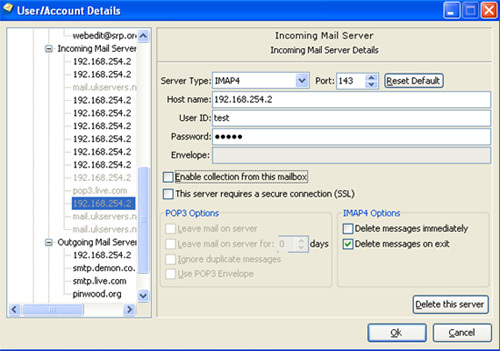 MailCOPA can modify the IMAP folder structure too, creating and deleting folders, and moving messages between folders. Some IMAP clients require that you subscribe to folders - ie, they won't be visible (nor any messages in them) unless subscribed to. MailCOPA automatically subscribes to all existing folders found on the server. Copies of outgoing messages are stored in the current user's Sent Items folder, unless you configure MailCOPA otherwise: you may want them to be saved in the Sent folder on the server. Messages are moved to a Trash folder on deletion. When messages are deleted from the Trash folder they are no longer available. If a POP3 collection is made (from MailCOPA or another client) ALL of the messages in the mailbox will be collected, whatever IMAP folder they are in. The IMAP folder structure exists only in the context of IMAP access, and has no meaning in the context of POP3 collections. If collections from an IMAP server are enabled, then each mail collection will check all messages on this server. If a message has not been previously collected, a copy will be collected and retained by MailCOPA so that it is instantly available to view. During collections, synchronisation will occur - any changes to the IMAP folder structure will be updated, and movements or deletions of messages will be recorded. Because of the limitations of the IMAP protocol, this may involve downloading messages again if for instance they have been moved to another folder (including Trash). If a folder in an IMAP account is selected, then a quick synchronisation with the server will occur, but no messages will be downloaded. The contents of the folder will be updated and if you select a message in this IMAP folder that has not previously been collected (eg it has recently arrived), it will be immediately collected, displayed and a copy retained by MailCOPA. Press the Add new Incoming Mail Server button. Now click a HotSpot on the image below for further information.